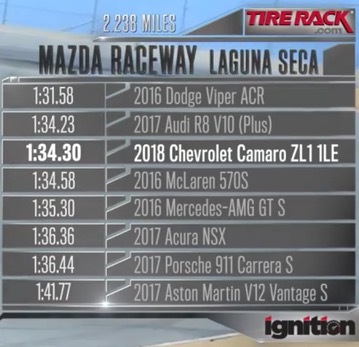 The ZL1 1LE shows it runs with other supercars as it set a 1:34.30 lap time at Laguna Seca. How impressive is this time? It bests a McLaren 570S, Mercedes AMG GT S, Acura NSX and nearly ties the new Audi R8 V10 Plus!